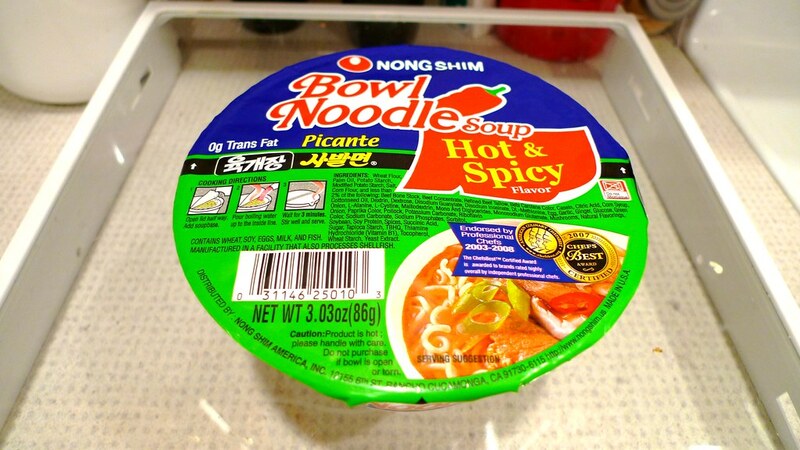 Nong Shim Bowl Noodle Soup - Hot and Spicy (Picante). 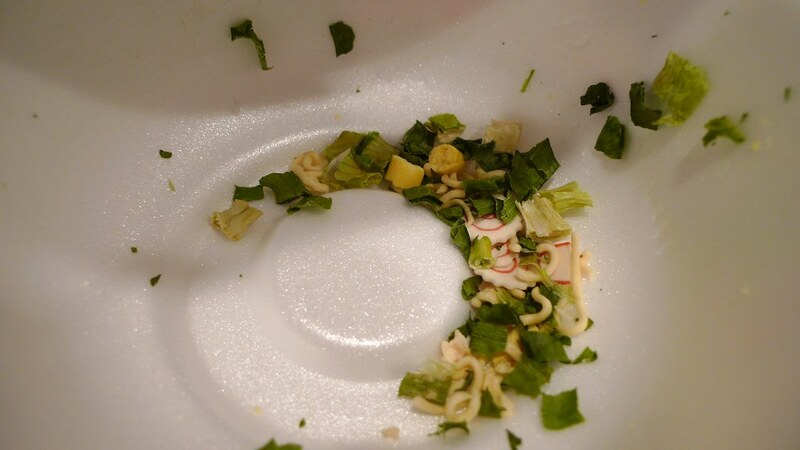 The Nong Shim Noodle Bowl is a bowl noodle I see just about everywhere. And for some reason, the hot and spicy (picante) flavor seems to be the most prevalent. But is it any good? Read on for the full review. 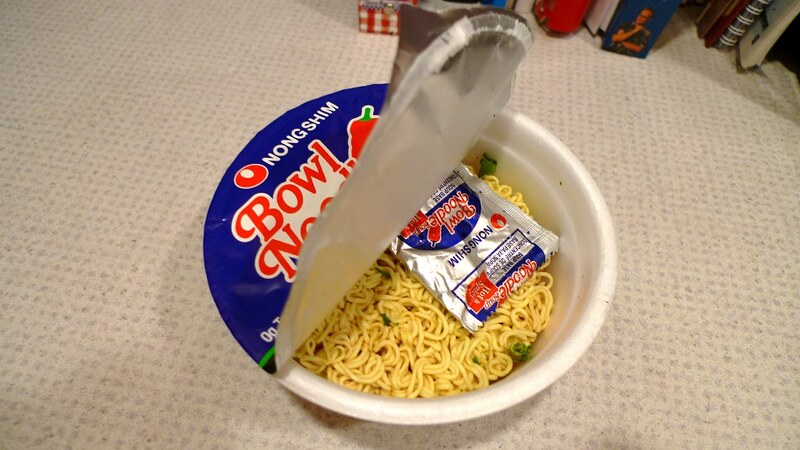 Inside the Nong Shim Bowl Noodle. 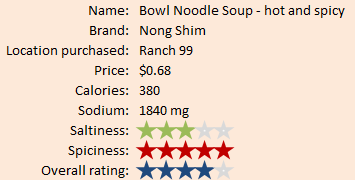 The hot and spicy flavor of Nong Shim Bowl Noodle reminds me of Nong Shim's Shin Ramyun. In fact, the ingredients are pretty close to matching. One of the main differences is that Bowl Noodle comes with thin slices of fish cake in the dry mix. But as far as spiciness goes, they're similar. 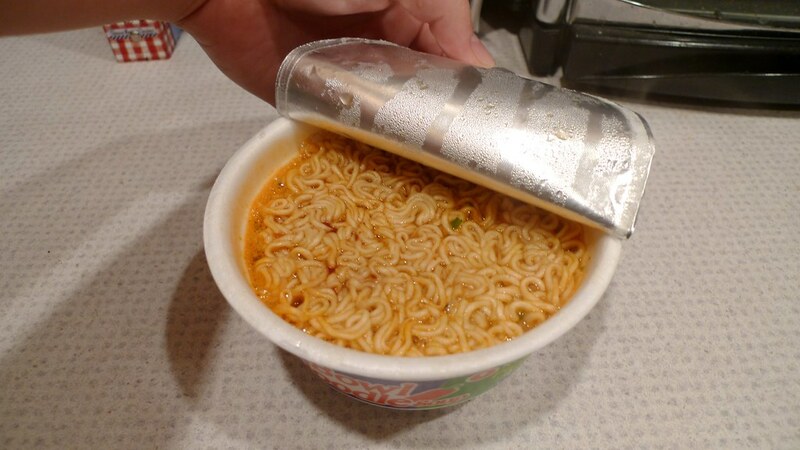 Adding the seasoning mix to the noodles in the bowl. 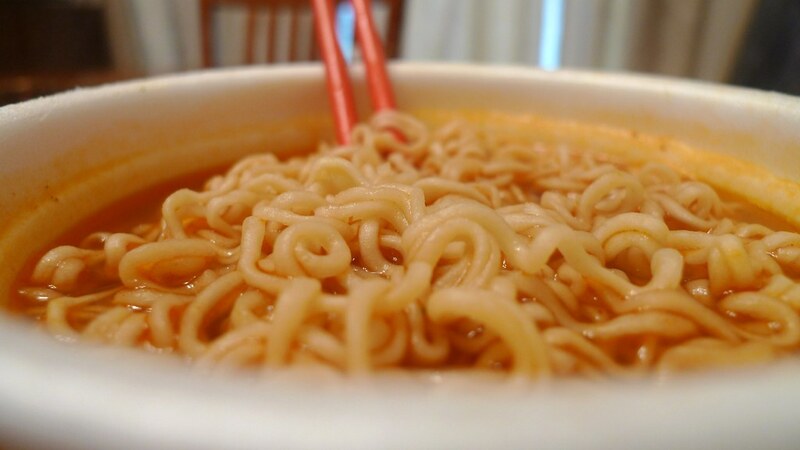 The noodles are thinner than Shin Ramyun, but thicken than Dosirac. They come in an uneven circular brick that seems to fit perfectly in the bowl. When cooked, they have a soft texture and really soak up the soup. Speaking of the bowl, it's made from styrofoam and therefore is stained by the soup base. Also, it cannot be prepared via microwave. The soup base is spicy. 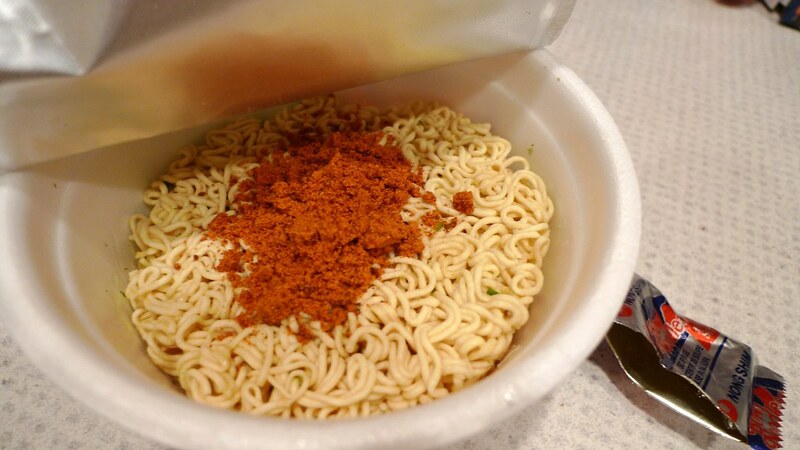 It comes in a red powder very similar looking to Shin Ramyun. It's not the spiciest I've ever had, but certainly well-deserving of a 5-star rating. If you can handle Shin Ramyun, you can handle this. The one problem is that the broth is not very flavorful. Just spicy. I know it's "picante", but it should at least have a stronger beef flavor or something. The dry vegetables comes already in the bowl instead of a packet. The bowl comes with dry ingredients as well, like green onion, mushrooms, and the aforementioned fish cake which is shaped in a star spiral (see above picture). However, there isn't much in there, so you might want to add more, or some extra stuff like a hard-boiled egg or some greens. It's fairly filling and I enjoy taking this for lunch every once in a while. The hot and spicy bowl ready to eat. 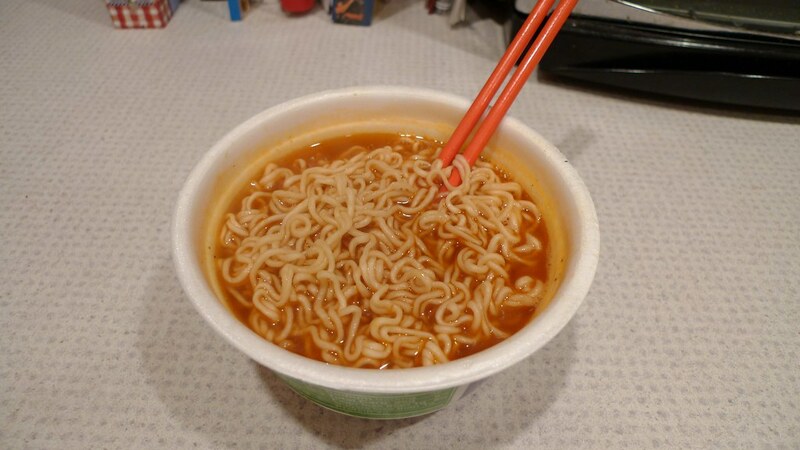 Look at how red the noodles are now from soaking up the soup. Yum! Didn't let Juliana try this one because she would cough like crazy from the spiciness. I'm looking forward to when she'll be able to handle the spice as it opens up a whole new door to the world of ramen and noodles. I'm a big fan of this bowl. You can't really go wrong with it. I just ate some of this stuff and I LOVED it. Yes, I coughed and choked from the spiciness, but the flavor is to die for. 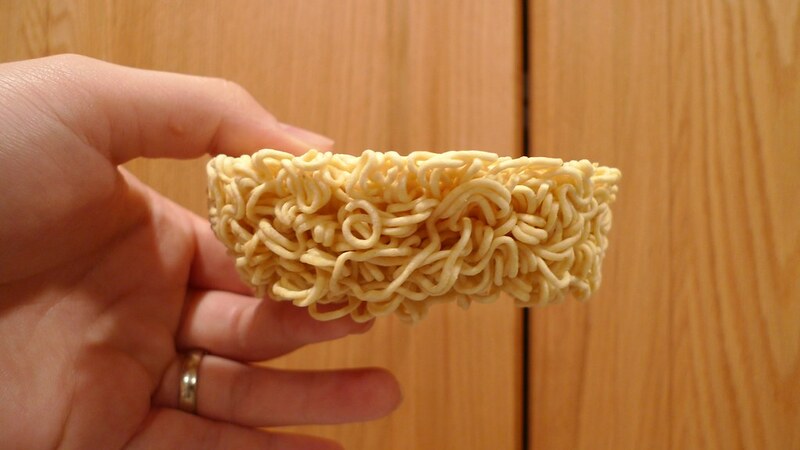 This is going to be my new instant noodle bowl. Man, this stuff is good.